Majolica is a ceramic collectible that has been receiving growing recognition - and consequently has experienced a great increase in value. This book presents a comprehensive look at this soft-bodied, brightly colored pottery with its high-relief decoration and clear lead glaze. 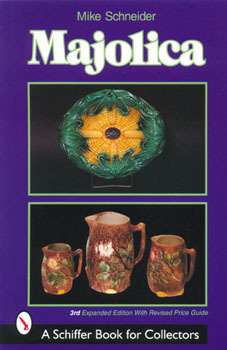 The various forms of Majolica are all covered in detail, valued, and amply illustrated with color photographs. They include pitchers, platters, plates, ashtrays, cups, mugs, and much, much more. The author traces the history of Majolica from its earliest roots in the 8th century to its emergence as a new form in London's Crystal Palace Exhibition in 1851, and the following decades of popularity. With this book in hand, you will become an expert in this fascinating collecting field.